RSHUT PRO is a system shutdown utility for Windows (95982000NT4MeXP and 20002003 Server) that allows quickly and automatically shutdown and wake up your computer remote computers in your home LAN domainworkgroup or large corporate network.Key Features:Control all the computers in a LAN domain at once. 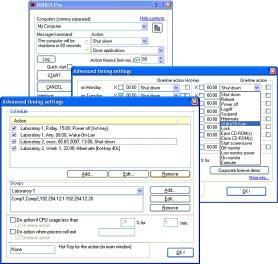 Immediatelly or scheduled at specific time Shutdown restart log off hibernate suspend or lock down computer Built-in scheduler allows different ways to schedule such as daily weekly etc. 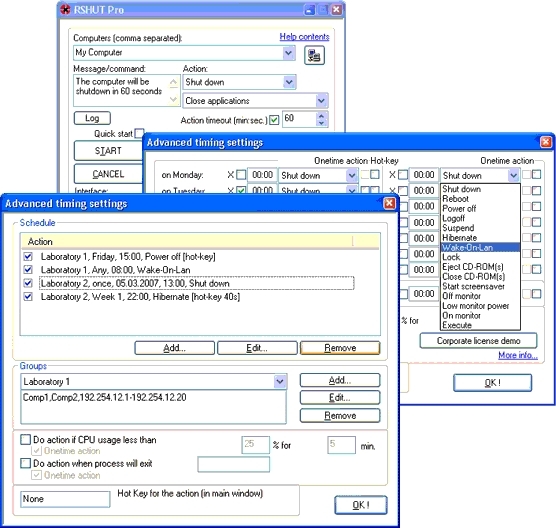 Saves time and work for network administrators from performing manually the same actions every day Wake up remote computers with Wake-On-LAN technology Autostart feature allows to automatically run in the system without logged on user Allows to use shutdown confirmations or shutdown computers instantly without any prompts Command line mode is available for scripting Remote installation allows to quickly deploy software on networked computers Saves your time electrical energy and money on electricity bills.